It’s been a long-held belief that birds’ feathers can date all the way back to dinosaur times. Now a team of scientists wants to learn the real origin of feathers, so they conducted a detailed analysis of fossilized bird feathers. Their study published in the Proceedings of The National Academy of Sciences sheds light on how feathers may have evolved since dinosaur times. Scientists conducted their study based on fossils from a small, feathered, four-winged dinosaur known scientifically as Anchiornis. They believe the ancient creature lived about 10 million years before Archaeopteryx, which was the first bird recognized by scientists. 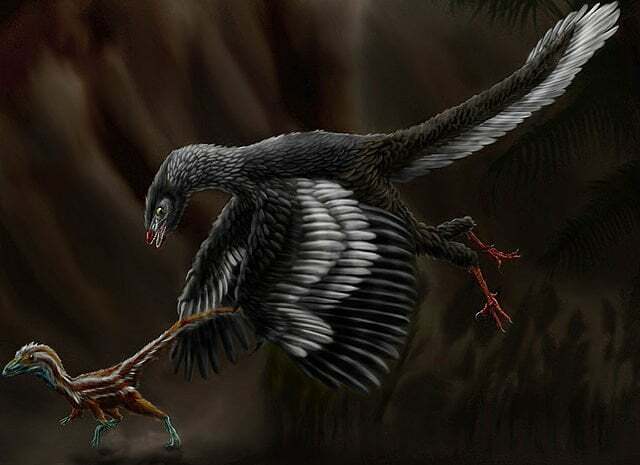 A team of international scientists from the Nanjing Institute of Geology and Paleontology, North Carolina State University, and the University of South Carolina worked on the study analyzing fossilized feathers. Yanhong Pan, one of the co-authors from the Nanjing Institute, examined the Anchiornis feathers using high-resolution electron microscopy. The team also used various chemical immunological techniques to learn what the feathers are made of. They used the same technique to study ancient feathers from the Mesozoic and Cenozoic periods. Their analyses found that the feathers had β-keratins and alpha-keratins, which are proteins that all vertebrates on Earth have, including mammals. The discovery surprised the scientists, given that alpha-keratins can be found only in small amounts in modern feathers. Interestingly, the team found that the fossilized feathers indicated that the wings had already gone through the deletion process, which separates feathers from other tissues. “Molecular clocks, which scientists use as benchmarks for evolutionary and genetic divergence, predict that the deletion, and thus functional flight feathers, evolved around 145 million years ago,” Schweitzer says.